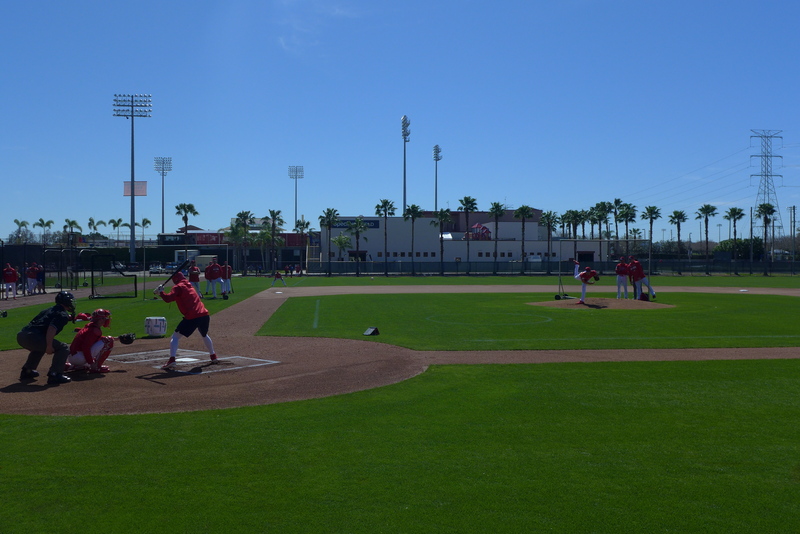 The Phillies’ first 2019 full squad workout commenced this morning. The beginning was more subdued that any I’ve seen in the past. At 11:00 AM, the pitchers exited the Spectrum Field club house and crossed Ashburn Field on their way to right Field on Carlton Field. Some time later the position players made their way from the club house to right field on Schmidt Field. Both groups formed a circle and proceeded to go through their pre-practice exercises. The pitcher’s group split afterward and got their long toss in on Carlton and Roberts Fields. The position players added some base running drills to their regimen. There was different action on each field. The pitchers performed their PFPs and the infielders split into two groups to run the fielding drills. Knowing that the infielders would take their BP on Roberts Field while the outfielders would hike inside Spectrum Field, I took up a position on Roberts and had a lengthy chat with Ethan Lindow’s grandfather to pass the time. The first grouping of Hoskins, Franco, and Segura delighted all with a homer barrage into the trees behind the left field fence. Hoskins launched one prodigious blast about four-fifths up the batters’ eye in center field. After the conclusion of BP, I found a live batting session on Ashburn Field. Enyel De Los Santos faced Roman Quinn and Adam Lane with a catcher and umpire. Game simulation included a break between innings while an imaginary opposing pitcher pitched. He threw three innings and looked good the two innings I saw. The completion of this exercise signaled the end of the workout. We were told before the start of pitchers and catchers last week that practices would start at 11;00 AM. But, we weren’t fooled and quickly learned that pitchers were reporting early and throwing over on Bowa Field (my name for the half-field by the west gate and ticket offices at Spectrum Field). Because it’s an infield and it’s small (get it). 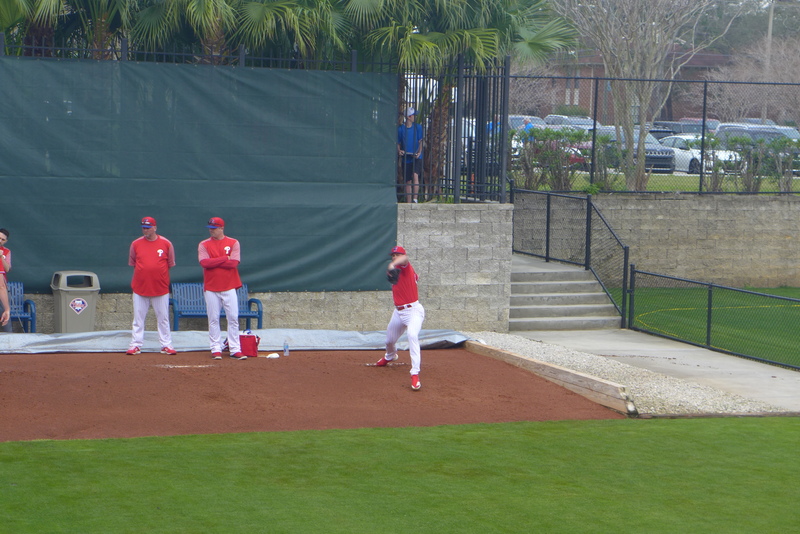 Various pitchers have been throwing there each morning and then working on pick off moves. Usually with Skipper Kapler as the base runner leading off. This morning, we watched Jake Arrieta, Nick Pivetta, Victor Arano, and Hunter. Arrieta always draws a crowd of reporters, staff, and other pitchers when he throws, as did Aaron Nola yesterday. 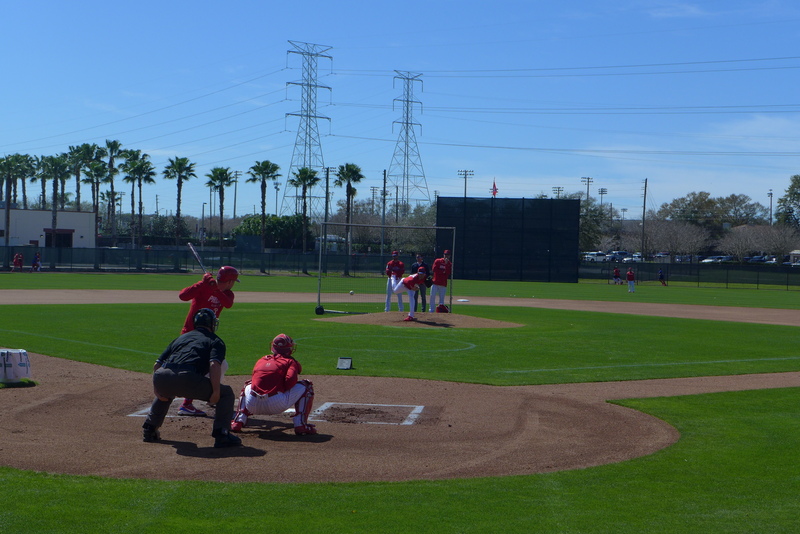 Several batters come out to stand in the box for the pitchers, today included Nick Williams and Roman Quinn. Realmuto and Brantley were the catchers. Knapp and Grullon practiced exchanges from glove to hand over on the diamond. The past several days, the position players who had reported early took BP in Spectrum Field. We could see the infielders take ground balls on Bowa Field before BP. There’s action all over the place and it’s hard to decide where to watch. And, if that’s not enough, the minor leaguers who have reported early begin soon after the major league camp stops at 1:00 PM. They were due at 11:00 AM and I greeted most as they started arriving around 10:10 AM. There are a lot more fans here than there were last year, and last week for that matter. Here are a few photos from the past few days. There’s a device on the grass in front of the batter. It records video of the pitcher. Kapler is behind the screen watching with the pitching coach. Beautiful weather for everyone too! Nice to see so many people enjoying the workouts. Can’t wait until the games this weekend. Packing the car and getting ready for the trip. Any info on Cole Stobbe? He looks fine. He says he’s healthy. ST will determine where he starts. Right now, I would think Lakewood with Bohm starting in Clearwater.